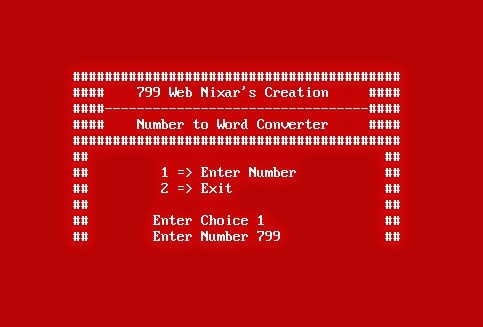 Number to word converter program using C.
Number to Word Converter is a small program to show numbers in their word form. In many systems, numerical data needs to be represented into the words. We can take example of cheques the amount is written in both digits(numerical) and words. This program is created in purely C language, Basically it takes input in number and then show its word form. 799 = Seven Hundred Ninety Nine. 1009 = One Thousand Nine. Description: Converts a number to word form. // Return sub string from given start Index to the end of string. // Return sub string from given start index to end Index. // Recursive Method to create word conversion of the given number.